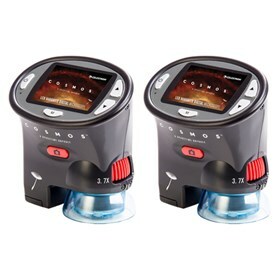 The Celestron 44312 is a Cosmos 3 MP LCD Handheld digital microscope is a portable microscope with a built-in digital camera, allowing you to view images on the integrated 2.4" color LCD screen. This handheld microscope has a 1x to 3.7x zoom range and a 54x optical magnification setting. It also features 4x digital zoom for an even closer look at specimens. A ring of six brightness-adjustable LED lights offers evenly-cast illumination of a wide range of specimens, including rock samples, stamps, circuit boards, plant life and more. 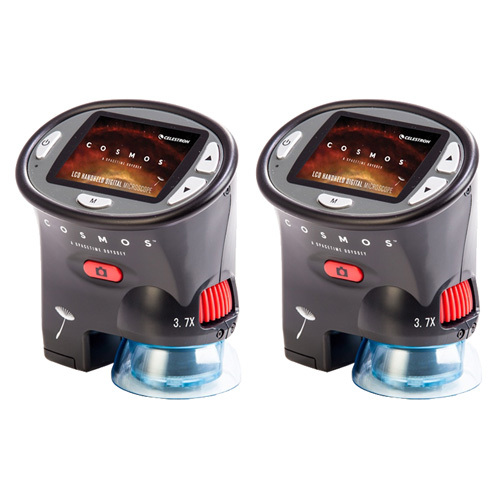 The Celestron 44312 2-Pack has many exciting features for users of all types. You can extend the lifetime of your Celestron 44312 2-Pack with the purchase of a FactoryOutletStore Factory Protection Plan. See the Celestron 44312 2-Pack gallery images above for more product views. The Celestron 44312 2-Pack is sold as a Brand New Unopened Item.